Rococo descibes the look and feel of this style to perfection; ornamental and elegant, light and carefree. The decorative frame is letterpressed in pink onto our soft Impression card, the gold foil is suggestive of extravagance, the look is opulent. 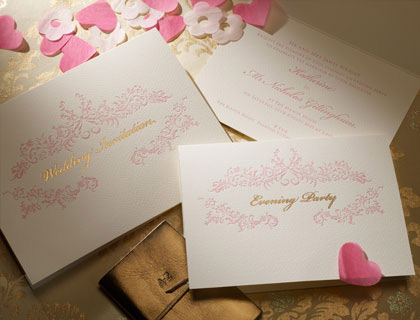 The standard wedding invitation is printed letterpress in pretty pink ink, bickham/trajan font style, with gold foil on 8″ x 6″ Oyster impression fly card, pretty pink ink inside, supplied with matching envelopes (unlined). 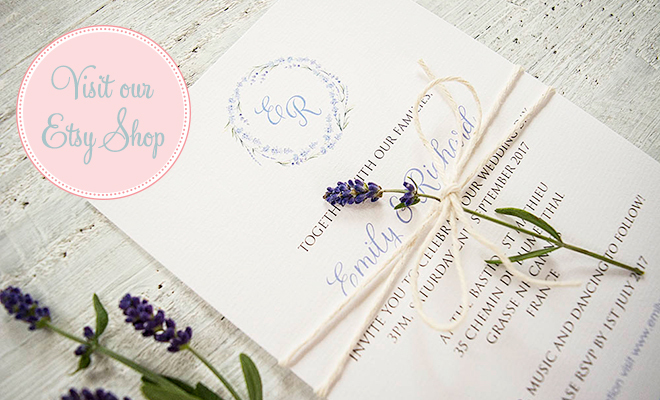 The invitation can be adapted to your preferred style and you have the option to alter: size, ink colour, motif style, print style and font, blink embossing, plate sinking, card type, gilt edging, lined envelopes, add bindi jewel or artwork to the design.